Yesterday morning when I got up there was frost on the windows in the den. Only the den, for some strange reason; even the neighbouring washroom’s window was frost-free. I would attribute the frost to the old, single-pane windows of the farmhouse, but other rooms have the same windows. 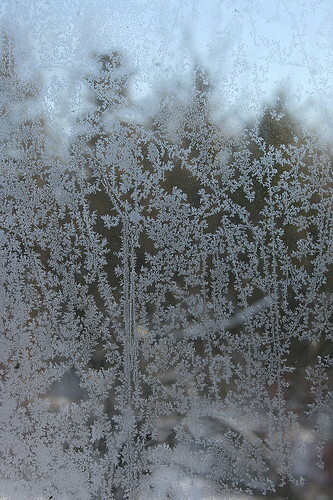 Even stranger, the two windows had completely different frost patterns. What causes frost patterns? Frost is ice, and like ice is simply a freezing of water molecules. 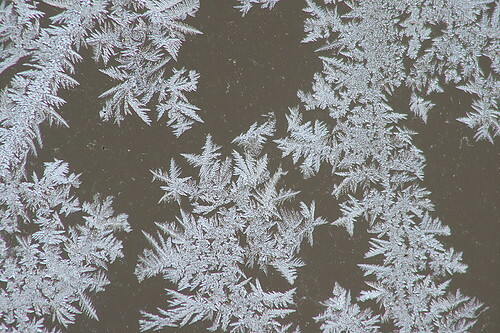 The patterns are a result of the environment the molecules are in when they freeze. Usually there needs to be some sort of catalyst, like a mote of dust or a grain of pollen. The water molecules in the air affix to this catalyst, and then other water molecules that bump into it affix to them. As the crystal grows, the likelihood of other molecules encountering it, and attaching to it, increases, in a positive feedback loop. 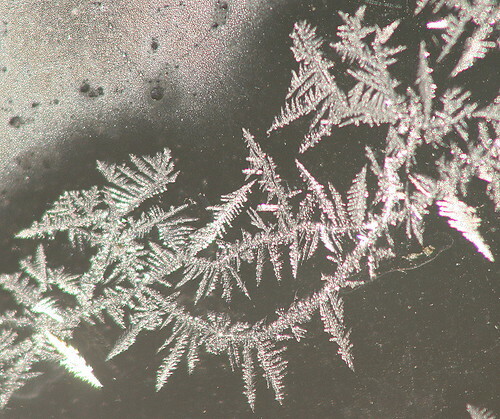 Snowflakes that begin on a catalyst are generally (though not always) non-symmetrical in shape. Occasionally water molecules will get together without a catalyst (not nearly as common as it takes some great coincidence for so many molecules to be at the same place at the same time), and, because of the way a water molecule is shaped and bonds, end up with six in a hexagon. Because the points of the hexagon stick out further than the sides, the new molecules affix there, creating the stereotypical six-pointed snowflakes. In the top photo it looks like the initial catalyst were strings of spider silk that had probably been blown from the plants in the garden onto the window back in the fall (given that spiders haven’t been particularly active lately). 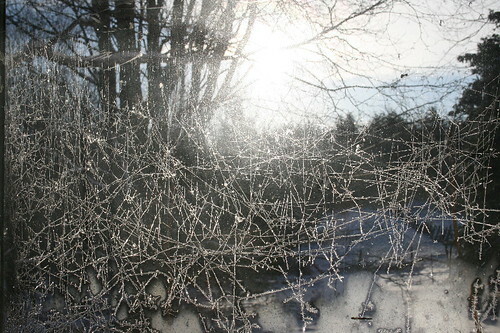 The frost was formed in strings that looped across the window in a neat criss-crossing pattern. Frost is beautifully intricate close-up. You can see the typical feathery shapes branching off the linear spider-silk catalyst lines here. The specific patterns of the feathery growths from the catalysts depends on numerous factors including, but not limited to, air pressure, air temperature, surface temperature, humidity, and even imperfections of the surface. These old windows are certainly anything but perfect! It looks like many of the feathers are also growing from the outer curve of the line, where the molecules would be more exposed. On the other window, Although there were some lines through the pattern, it wasn’t the same sort of criss-crossing. Instead, it was more of a flowery blanket of round feathering. I suspect the pattern on this window was more dependent on dirt or glass imperfections for determining the pattern of crystal growth, with the exception perhaps of a few strands of silk creating the lines. As to the reason that only the southeast corner of the house had frost on the windows, I can only hypothesize. Perhaps there was a south wind blowing that chilled those windows more than others? It was a particularly windy day, though I neglected to note the direction. It may remain a mystery. ok, so I live up here in Wisconsin and my window freezes over in the bathroom and this is what I end up with. I come from the south of England and have not had many frosts yet this year. however my car is parked in the open and was frosted on consecutive days last week. On the first day the roof of the car had frosted fern patterns that involved quite large swirls of leaves on a large scale. The next day the night had been more humid and the frost was like a crew cut white haired man with hairs standing on end. I have photographed them but do not know how to submit them. I came upon this web page in search of the reason for the patterns. Jennifer Frost – Kristin you did such a fabulous job!!! We love all of the pirtecus and love that you posted us on your site = ) We are excited about getting our pirtecus so I can put them up in the house yippie!!! !